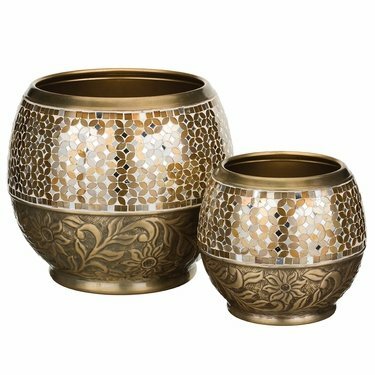 Brilliance and elegance are combined together to create this pair of hand-crafted Brass Jewel Planters! Turned metal vessels are adorned with intricate hand-tooled designs and mosaic glass patterns. Now Available in three styles: Blue, Brass and Bronze. Sold as a set of two nesting sizes, for indoor or outdoor use.